An uplifting story of hope, fortitude and family. 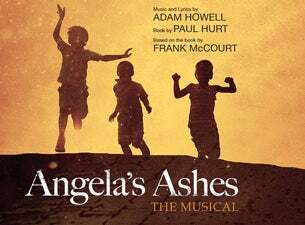 In a major musical adaptation, Frank McCourt’s memoir ANGELA’S ASHES comes to the Bórd Gáis Energy Theatre in an emotional telling of a childhood in Limerick and beyond, featuring unforgettable songs and melodies, told with a rare lyricism and a warm inimitable sense of humour. A haunting score adds to the emotional impact and the humour of the story. Angela's Ashes has that rare gift of bringing an audience to tears one minute, laughing out loud the next – by turns, deeply moving and riotously funny, this new musical promises to be one of the major theatrical events in Ireland in 2017.